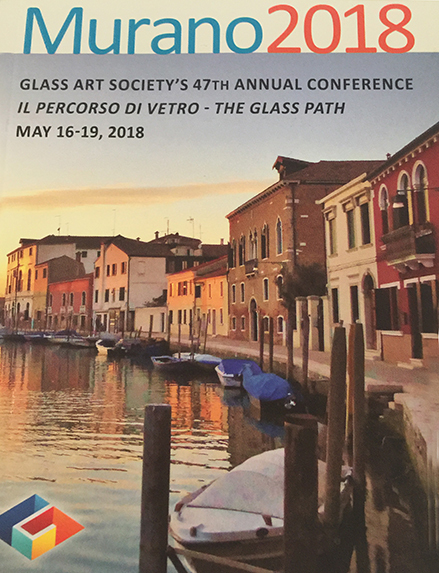 The island of Murano was host to the GAS (Glass Art Society) with world wide participation. Everyone who works with glass paid tribute to the heritage of Murano. This week it was evident and the pure joy and excitement of the students of glass as they wandered around the island was abundantly obvious. While I might not completely agree with GAS selection of artist and venues, I do not believe that anyone went home unhappy with the experience. I met artists from all over the world who paid $100+ dollars to tour Murano glass factories and watch maestri from around the world work alongside Muranese in the furnaces of Barovier & Toso, Venini, Effetre and Carlo Moretti. These are not your “tourist” factories, but truly production facilities and home to some of the most famous Maestri of Murano. There were presentations every day by the best in the business. The Life Time Achievement Award was presented to the family of the famous Pino Signoretto as he unfortunately died late last December. His works are known around the world and many students from Pilchuck in Seattle were in attendance. One of the more important discussion panels focused on the environmental issues of the minerals used to achieve the bright colors we all love. The panel included academics in chemistry and physics as the making of glass involves both. Specifically, the use of Cadium, Arsenic, and Lead. Glass producers, large and small are attempting to find a substitute as it is an essential mineral for some of our favorite colors, like red, rubino and opaque colors. The major risk is not in the end use of the glass, but for those who work producing the batch (made from soda, sand, and minerals) which are a hazard to breath when making the batch; for those involved in the working of the molten glass and for those who reheat the glass (such as lampworkers).Inhaling cadmium-laden dust quickly leads to respiratory tract and kidney problems which can be fatal (often from renal failure). There is a race to resolve this problem, and I only hope that the first one to achieve this goal is not allowed to patent the process as that would prohibit small furnaces from making their own glass. For those who depend on the glass rods from Effetre Moretti, we hope they find a solution quickly. But the best part of the entire conference for me was the Glass Fashion Show. 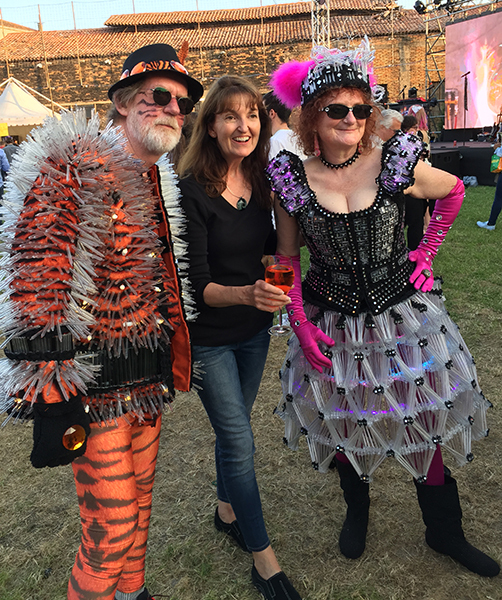 The artist had made their own outfits, some costumes took as long as 5 months to complete and one weighed about 70 pounds. Several were lighted like Christmas Trees and glowed beautifully against the background of the water. It is a tradition at the end of the conference, but this year, the models arrived in gondolas and floated down the Rio del Vetrai. 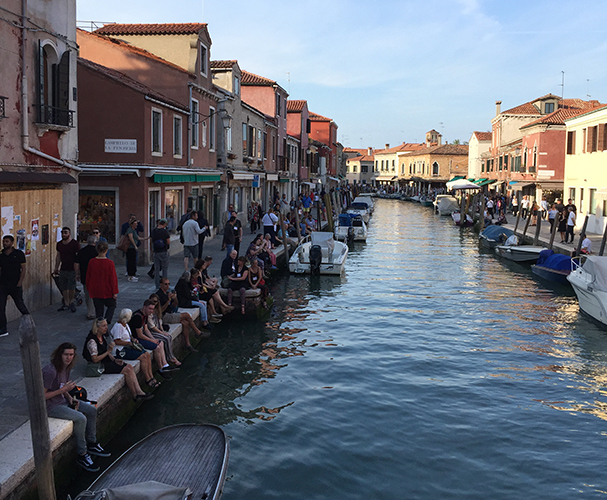 Both sides of the canal were crowded with the attendees of the conference gleefully drinking Spritz (the local favorite). Locals were watching out their windows upstairs. I left the sounds from the crowd as it gives you an idea of how rowdy and enthusiastic it was. 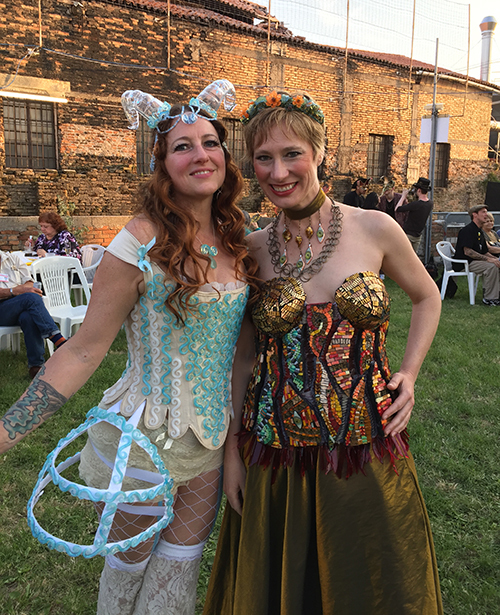 The conference concluded with a giant party on the grounds of the San Pietro Church with local foods and drinks, music and dancing lasting to the wee hours. Sunday morning was quiet as every one recuperated! The opinion of many was that Murano should be the host of the conference again soon! Wonderful to see such a deserved homage to Murano and it’s ancient traditions in glass making and high art. Must have been a thrill to be there. Hopefully the issues you spoke of will be resolved soon for all to continue to use and enjoy the beauty of Murano glass. Thank you for this blog! It was truly an amazing experience to be there! Although, I felt very overwhelmed and felt like I missed so many things. We have been working in glass since 2000 and have a studio on the Oregon coast. We will absolutely be returning. I was wanting to buy some of these millefiore pendants for my gallery in Oregon in a larger quantity. Is the best way to buy them off your website? Or is there a way to contact you. Hope to meet you next time we are there. Which will be soon! Thank you to Murano for hosting such an amazing time! Yes it was a great time for all the GAS members and a good many spritz sold! I am not sure which items interest you. We do sell many pendants on our website: http://www.venetianbeadshop.com and do have wholesale pricing. You will need to create and account and submit the wholesale application form, found on the top of each page. We look forward to assisting you.